Fried shrimp balls may have a naughty name but these appetizers are nice to eat during holiday gatherings (Christmas and New Year) and throughout the year. We like to order fried shrimp balls from the dim sum menu when we at Chinese restaurants that offer them. Some are plain and soft, but we like the crunchy thread-like coating for its artistic presentation. Be naughty yet nice and fry some shrimp balls for the holidays and on National Fried Shrimp Day. In a blender (we used our nifty Nutribullet), place the egg white and beat until frothy. 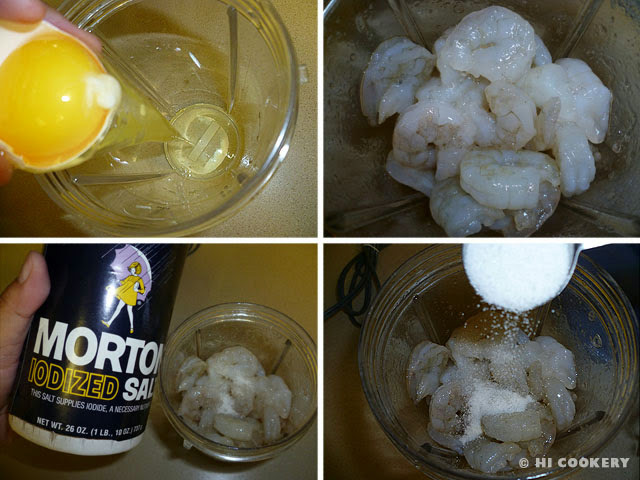 Place the shrimp, salt and sugar in the container. 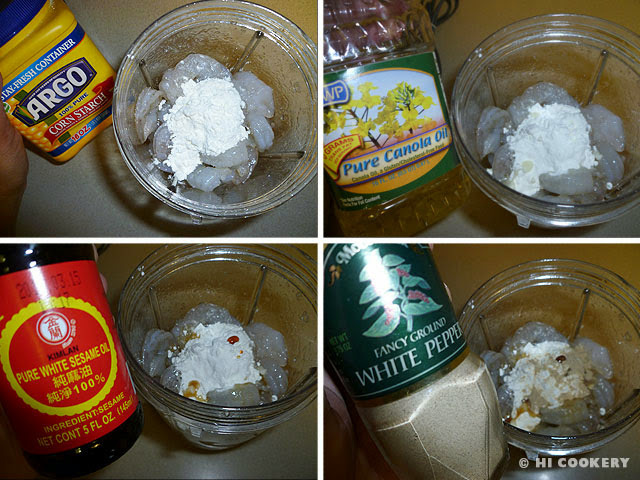 Add the corn starch, vegetable or canola oil, sesame oil and white pepper powder in the container. Blend until all the ingredients become paste-like. 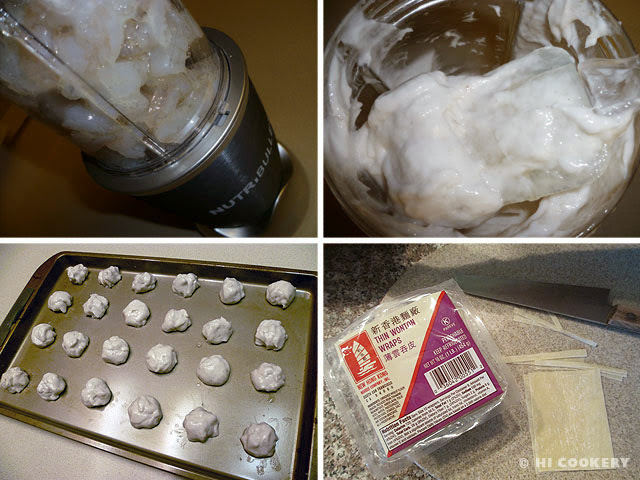 Using slightly wet hands, form the paste into one-inch balls. Refrigerate for at least 10 minutes to set. Slice the won ton pi into thin strips. Roll the shrimp balls in the strips to coat evenly. 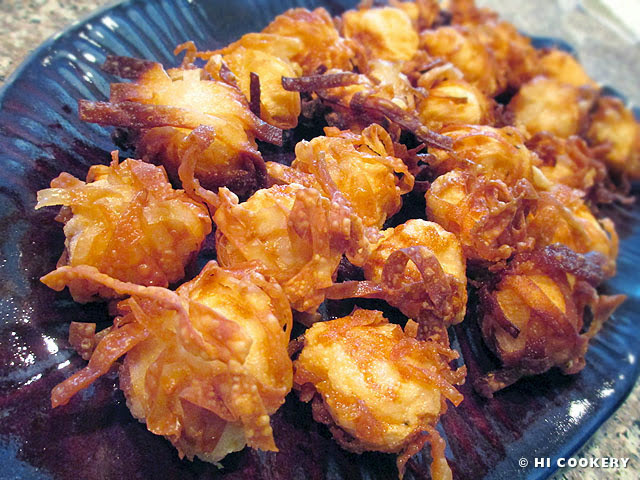 Heat the oil and deep fry the shrimp balls until puffed up and golden brown. Remove and drain on paper towels. Transfer to a plate and serve hot with sauce. Yield: 2 dozen fried shrimp balls. Thanks to our friends Pat and Phyllis S. for helping us prepare the fried shrimp balls for our blog. Phyllis helped to roll them in the won ton pi while Pat fried them in his wok. Serve the shrimp balls with soy sauce or sweet Thai chili sauce. The balls may flatten slightly but will puff up into rounds when fried. 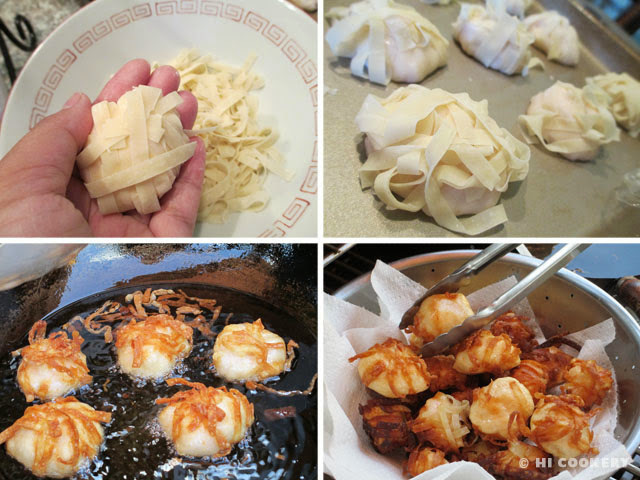 If not coating the balls in won ton strips, deep fry plain until golden. Poke toothpicks or skewer a few fried shrimp balls for an appetizing arrangement on a party platter. Search our blog for more shrimp recipes.